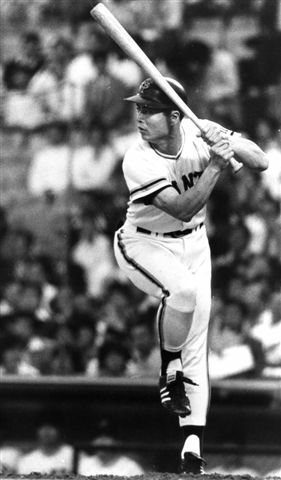 The undisputed, all-time Japanese baseball home run leader is, of course, Sadaharu Oh, who dominate professional Japanese league record books with his 868 total round-trippers…including many grand slams known as "Sayonara" home runs. Click to view a video highlighting Mr. Oh's landmark home runs. Oh wasn’t blooping fly balls over short fences, either. 191 of Oh’s homers were hit 394 feet or more, which would have put them out over the fence in straightaway right in almost every major league park of Oh’s time, much less down the right field line. Another 286 were hit 361-393 feet, which means many to straightaway right would have gone out, and virtually all down the right field line would have been out of every major league park. Another 289 would have gone out of most major league parks if they had been pulled to the right field corner (361-393 feet). Only 102 were less than 328 feet, and even a few of those would have gone out down the right field line in some major league parks, like Yankee Stadium. Oh ended his career with 868 homers in 22 seasons. Unlike Aaron, he became a big league manager, taking over his former team, the Giants when the 1980 season began. He continues to be one of the most influential and popular figures in Japanese baseball. In 2006 Oh solidified his legendary status by leading his Japanese national team to the first ever championship in The World Baseball Classic (see Oh World Baseball Classic). The greatest catcher in the history of Japanese baseball, Nomura holds the world record for most games played by a catcher with 2918 over his 27 year career; he also has hit more home runs than any catcher in history with 657 (a total that ranks second to Sadaharu Oh in Japan). Nomura won nine home run championships (8 in a row), six consecutive RBI titles, and one batting average title. That came in 1965 when he won the Triple Crown with 42 homers, 110 RBIs, and a .320 batting average. He retired in 1980 and is a member of the Japanese Baseball Hall of Fame. In 1971, his 2nd year at the Nankai Hawks, he batted third and achieved a splendid record:.300 BA, 31 HR, and 120 RBI (1st in the P.L.) Though the powerful hitter was sidelined with a severed Achilles tendon in 1979, he made a comeback in 1980 with 41 HR and in the following year he was a co-leader in home runs with 44. He was the solo leader in HR in 1983 with 40. His best year was 1988 when he appeared in all of the games batting .311 and led the P.L. in RBI (125) and HR (44). This was the best performance for a player aged 40 or more, and he deservedly won the MVP and the Shoriki Award. He also played for the Orix BlueWave (1989-90) and the Daiei Hawks (1991-92). His career record: 23 seasons (outfielder, DH), 2,571 games, 8,868 AB, 2,566 H, 1,678 RBI, 567 HR (the 3rd in career record, following Oh and Nomura), and .289 BA. He has the P.L. record in most career BB (1,273), most season bases-loaded HR (4; 1983) and most BB in a game (5; 1988), and led in OBA in 1981, ’87, and ’88. He appeared 14 times in the All-Star Games and 7 times in the Best Nine and 8 times in the Top Ten in BA. He throws and bats left. Hiromitsu Kadota ranks 3rd all-time in Nippon Pro Baseball in home runs (567), behind only Sadaharu Oh and Katsuya Nomura. His 11 grand slams are tied for 6th. He is 12th with 383 doubles, 4th with 2,566 hits, 3rd with 1,678 RBI, 8th with 1,319 runs, 4th with 4,688 total bases, 4th with 1,273 walks (the all-time Pacific League leader) and 6th with 2,571 games. He hit 133 homers after his 40th birthday. Kadota's career line in NPB was .289/.379/.529. He made 14 All-Star teams. In 1979 he severed his Achilles tendon and the next year saw three changes - he moved to DH, changed his uniform number to 44 to honor his mother (who had just died at 44) and his production improved drastically. He went from a good hitter to a great one, homering 40 or more times 3 of the next 4 seasons and slugging over .600 the same 3 years. He won HR, walk and slugging crowns in 1981 and 1983 and an OBP title in 1981 (.434). He made Best Nine in '81 and '83. In '81, he homered 16 times in July, setting a new record for long balls in a month. In '83, he hit 4 grand slams, a Pacific League record. Yamamoto holds the Japanese All-Star game record with 14 homers. A career .290/.381/.542 hitter, he retired third all-time with 536 homers - he is now 4th behind Sadaharu Oh, Katsuya Nomura and Hiromitsu Kadota. His 11 grand slams are tied for 6th all-time. He also had 2,339 hits (11th all-time), 372 doubles (16th), 1,475 RBI (8th), 13,65 runs (6th), 4,361 total bases (7th), 1,168 walks (8th), 79 sacrifice flies (tied for 10th) and played in 2,284 games (10th) and 8,052 AB (11th). In 1977 Yamamoto started a stretch of five straight 40-HR seasons - the typical year in this span was about .320/.420/.670. He led the league in runs three times, homers three times, RBI three times, total bases three times, slugging three times and walks once. He won another MVP in '80, the Carp won both their Japan Series in this time, and each year in the 5-year span Yamamoto led the league in at least once major offensive stat. Kazuhiro Kiyohara has been one of Japan's greatest sluggers for two decades. As a rookie with the Seibu Lions, Kiyohara made an immediate impact, hitting .304/.392/.584 with 31 home runs. He won Rookie of the Year honors in the Pacific League that year - the 31 HR matched the best by a Japanese Rookie of the Year and might be a rookie record. He was selected to the first of 17 All-Star teams. With 514 career homers, Kiyohara has moved up to 5th all-time in NPB despite having never led his league. Now in his 18th season, he needs 22 more to tie for 4th Koji Yamamoto, but 3rd place would seem to be out of reach (Hiromitsu Kadota with 567). Kiyohara is second all-time with 10 sayanora homers, 1 behind Katsuya Nomura. He is in the top 10 in RBI, total bases. Ochiai was the greatest hitter in the Pacific League since Katsuya Nomura, perhaps the best ever. His career line was .311/.422/.564. Ochiai didn't become an everyday player in Nippon Pro Baseball till 1981, at age 28 - but he did more after his 28th birthday than basically anybody did in a whole career. Despite his late start, he is 6th all-time in HR (510), in the top 20 in doubles (371), 9th in hits (2,371), tied for 6th in average, 5th in RBI (1,564), 7th in runs (1,335), 8th in total bases (4,302), 2nd in walks (1,475, trailing only Sadaharu Oh) and 13th in games (2,236). Presumably he is in the top 5 in OBP and slugging as well. Ochiai refused entry in the Meikyukai due to their arbitrary statistical requirements. He also made the first of 15 All-Star appearances. In '85, he won his second Triple Crown - .367/.481/.763. He set new Pacific League records for RBI (146), total bases (351), runs (118) and slugging and tied the HR record (52). He won his fourth batting title, led the league in walks (101) and OBP, was an All-Star and Best Nine (at 3B). He also won his second MVP. After retiring, Ochiai became a baseball commentator. In 2004 Ochiai was hired to manage the Dragons. He scaled back Japan's intensive practices and was very successful (just like Bobby Valentine, another opponent of Japan's training who was having success with Chiba Lotte). 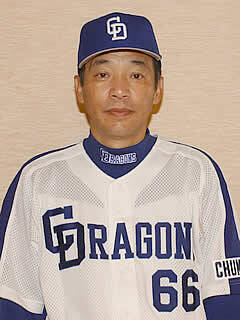 The Dragons went to the Japan Series in Ochiai's first year at the helm. Isao Harimoto is the only player in the history of Nippon Pro Baseball to reach 3,000 career hits. An 18-time All-Star, Harimoto is the only player in NPB history with both 500 homers and 300 steals. He is tied for 7th all-time in Japan in homers (504), is 9th in triples (72), 5th in doubles (420), tied for second in average for players with 4,000+ AB, fourth in RBI (1,676), 3rd in runs (1,523) and 3rd in total bases (5,161), His career OBP was .399 and he slugged .534 overall. In 1990 Harimoto was voted into Japan's Baseball Hall of Fame and in 2000 he won a higher honor when he was voted onto Japan's All-Century Team, one of only three players from pre-1965 who made the squad as voters favored newer players. The other two outfielders (Ichiro Suzuki and Hideki Matsui) were still active; only Sadaharu Oh and Shigeo Nagashima joined Harimoto as old-timers still with enough fame to join the team loaded with active or recent players. 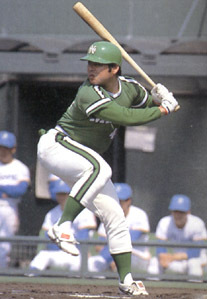 A longtime member of the Hiroshima Carp, Sachio Kinugasa played 2215 consecutive games between 1970 and 1987, unlike Cal Ripken Jr., he retired with his streak intact. Kinugasa also hit 504 career home runs in his long career. The third baseman was aKen 13 time all star.